For many homes across the country, indoor air often becomes dry and stale, especially during the cold weather months. For this reason, many homeowners opt to install a whole-home humidifier with the furnace in the HVAC system. While you could place portable humidifiers in different rooms, a whole-home option is much more efficient. Here are some things you should know if you consider this option for your home. Every home should have a certain level of humidity in the air. First, more humid air is ideal for those who suffer from respiratory problems. Proper humidity levels prevent flare-ups from asthma and help keep the lungs healthy. In fact, healthy humidity levels are good for everyone’s overall health. Moisture in the air is good for the skin and is great for those who snore, as the moisture helps lubricate the sinuses. Humidity can also reduce dry and irritated skin. A home with proper humidity is also more comfortable during the winter months, as moist air is easier to heat than dry air. This is the reason people refer to humid regions as hotter even when the temperature is the same in drier regions. The same goes for a home’s temperature. When the indoor air is more humid, the temperature will feel warmer. Most whole-home humidifiers work together with your furnace. But beyond that basic function, you have different options to choose from, all of which function in different ways. A bypass humidifier joins with the duct work and only turns on when the furnace is running. This kind of humidifier doesn’t require a separate power source. Instead, it works using the furnace blower to help move air through a water source which then moves through the house. A humidifier powered with a fan is another option. The fan moves the air through the humidifier’s water source. You can use the humidifier whether the heat source is on or not. However, you will need to leave the fan on for this option to work. 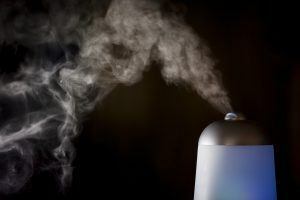 A steam humidifier is another option. It uses boiled water to create steam. The steam will combine with the air and circulate moisture through the furnace. This humidifier is the best at making the most humidity, but it also requires the most electricity, which could increase your overall costs. Despite having excess moisture in your air, whole-home humidifiers don’t damage any furniture or woodwork in your home. The same cannot always be said for the portable models. Also, the whole-home model is hardwired into your plumbing system. You do not have to worry about refiling tanks like in portable models. You also have better control over how much humidity output you allow with your whole-home humidifier. Portable models have a few different settings, but they are not always accurate. They also do not fill the entire home without several units scattered through the home to manage. A whole-home humidifier is not visible, as it is hidden away with the rest of your HVAC system. It is also quiet, so much so you would not know it’s on. In addition, the installation of a whole-home humidifier can add value to your home because most home buyers consider this option an upgrade. If you would like more information on whole-home humidifiers or if you need assistance with your HVAC system, please contact us at Lakeside Heating & Air Conditioning. Our licensed professionals are happy to help you with any HVAC needs you may have, and we have a wide selection of humidifiers for you to choose from.